This is Emily (from high school, jr high, and elementary - WOW). My sister is good friends with Jessica, and she told me about your new little baby and the situation with his heart. So, I've become a blog lurker and I checked out your blog. 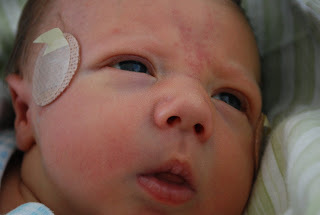 It sounds like you've had a crazy month, but it looks like your little boy is a fighter. One of my best friends has two little girls with pacemakers, so I am kind of up-to-date with the heart "lingo." Anyway...I've just been thinking of you guys these past couple of days and wanted to let you know. Good luck (I hate that saying! It should be "Good Blessings," or "Good Faith" or something like that because very little of it is luck.) Your other two boys are simply adorable as well. And you look amazing by the way! I just wanted to tell you I loved the blessing today. What a beautiful day for you guys. Also, your testimony was just so sweet and heartfelt, thanks for sharing with us.